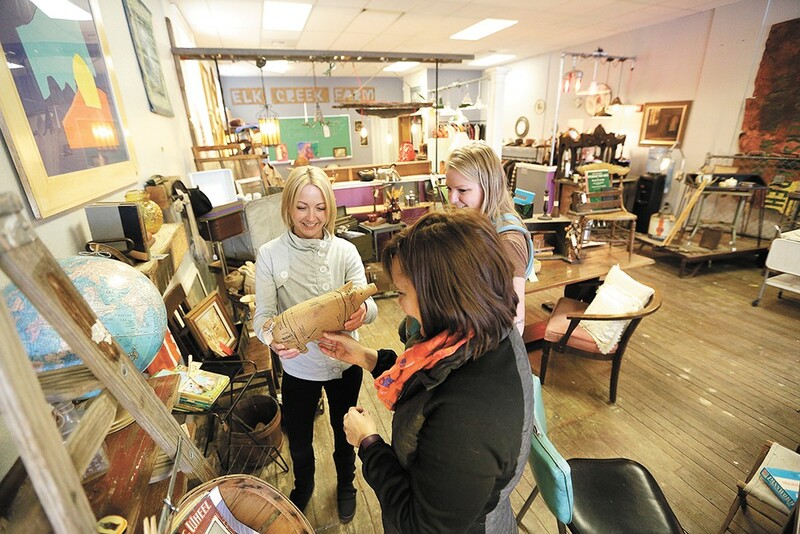 FROM LEFT: Mandi Neale, Rachell Fincher and Jessi Fincher explore the treasures found at 1889 Salvage Co.
"We like to tip things on their ear here," says Gina Campbell, owner of vintage shop 1889 Salvage Co.
She says this standing beneath a bare metal box spring, which sits atop metal bars, which sits atop a red window that was converted into a table and framed with wooden posts — in other words, the crafty and creative check-out area of the store, which opened last September. 1889 Salvage Co., the latest addition to the vintage, antique and thrift shop mecca that is Monroe Street, also offers custom-built creations. Her collection, about half her finds and half those of her vendor-partners, features vintage home décor, books, photos and clothes, and shines thanks to skillfully arranged vignettes. A zebra-print chair pops against a plush red rug; an antique toolbox flips and turns into a shelf; and a purple velvet Christmas tree from Nordstrom is now a completely logical spot to hang portraits from the early 1900s. "I'm going to garage sales, estate sales, thrift shops," says Campbell, who occasionally sold her finds at flea markets until the space at 2209 N. Monroe opened up. "I'll pull my car over and grab something off the side of the road, out of the dumpster. If I think I can give it new life, it's mine!" Campbell is used to showing things off; she was director of visitor services at Visit Spokane for nearly eight years. She designed and led tours for visitors and companies, led workshops on Spokane history for hospitality and customer services workers, and drew the store's name from that passion for history (and the hunt for vintage goods). "Not only was 1889 the year that Washington became a state," Campbell says, "it was also the year of [Spokane's] Great Fire, and out of the ashes came a new city, brick buildings, new industry." She hopes to offer the same rebirth for the items she finds. As one of the newcomers to Monroe, Campbell says her main mission is getting the word out about the store before construction begins next year on the highly divisive North Monroe Corridor Project, which would reduce Monroe Street from five lanes to three. Though it's a tough hurdle for a new business, scant parking and a lack of pedestrians already pose a challenge, so Campbell thinks it will be worth it. "I think it's going to catapult this corridor into the next stratosphere," Campbell says, "and bring it to a level like South Perry Street. A really cohesive, fun place to walk around." She hopes to continue drawing customers in through enticing photos of her merchandise on Instagram and by partnering with online vintage shop Sicilia's Closet for a Vintage Clothing Pop-Up Shop on April 8. For now, she'll keep doing what she does best. Spokane Liquidation / Monroe International Foods & More, 2106 N. Monroe: Peruse a selection of discounted home goods, clothes and auto parts, among other things, then cross over to the mini Arabic market, which offers halal and kosher meats, Arabic coffee, Syrian pita bread, halva (a fudge-like sweet), date syrup, molokhia (a leafy vegetable) and more. Boulevard Mercantile, 1905 N. Monroe: The main floor of the historic Stewart's Hardware building houses an eclectic mix of vintage home and garden décor and beauty products. Downstairs, the cozy, rock-walled basement is mostly dedicated to vintage threads. New inventory from Boulevard's many vendors comes through the door on a daily basis; follow the shop on Instagram (@boulevardmercantile) for hot new items that always seem to sell fast. Kingsley & Scout, 2810 N. Monroe: You can't miss the turquoise-and-purple storefront at this new men's boutique. Co-owners Billy Jones and Nick Lewis make sure you get your fix of denim, shirts, beanies, hand-stitched leather goods, bourbon- and tobacco-scented candles and even scotch-flavored toothpicks. Vintage Rabbit Antique Mall, 2801 N. Monroe: Vintage Rabbit is nearly vintage itself, serving up a variety of collectibles and antiques to Spokane for more than 20 years. The mall recently hopped a few blocks north on Monroe to a new, larger location, where there's sure to be a treasure hiding around every corner. 4000 Holes, 1610 N. Monroe: This record shop is a Spokane staple, around since 1989, and named after the lyric in the Beatles' "A Day in the Life" referring to potholes in the northern English town of Blackburn (which easily translates to Spokane). Check out a regularly rotating collection of vinyl, CDs, DVDs and books. And of course, Beatles memorabilia. Giant Nerd Books, 709 N. Monroe: Say hello to Happy the Alligator (and the other animal skulls in the shop's menagerie) and browse through owner Nathan Huston's carefully curated collection — ranging from odd to kind-of-out-there — including novels, biographies, art books, fantasy fiction and comics.